I have to leave the house today. I am thinking about saying, “Ned? Ned Ryerson?” to every person I am asked to shake hands with today. I actually often think of that scene, particularly out at clubs or at professional events. For any of you who may be so culturally impoverished as to have not yet seen Bill Murray’s starring turn in the movie Groundhog Day, please rectify this failing as soon as possible, but I will now give you background. 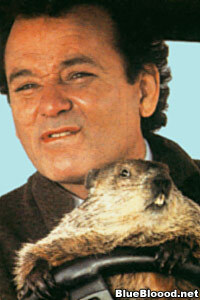 Groundhog Day is a classic comedy . . .